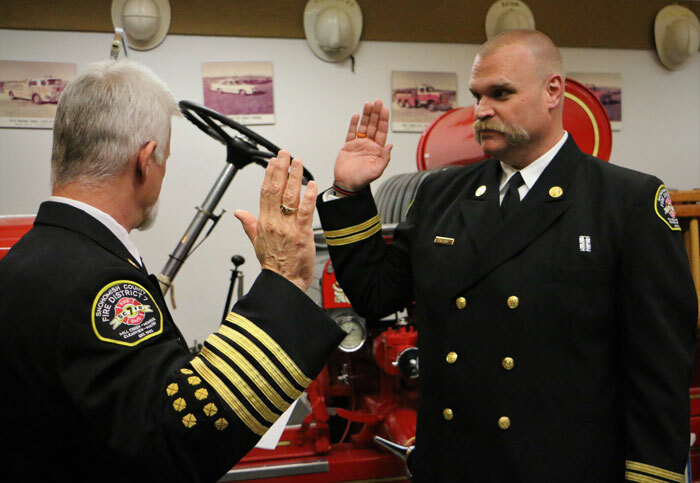 Fire Chief Gary Meek swearing in Battalion Chief Evan Adolf. Photo courtesy of Fire District 7. At the Tuesday, November 21st, 2017, regularly scheduled board meeting, Fire District 7 had the honor of swearing in and pinning our newly promoted Battalion Chief, Evan Adolf. Executive staff, family and coworkers were there to hear him take his oath and receive his badge. Adolf started with Fire District 7 in September of 1990 through our resident program. He was hired as a career firefighter in January 1993. From there Adolf promoted to Lieutenant, then to Captain and was assigned to the Training Division where he has served for the last nine years. Adolf embodies Fire District 7’s slogan of “Earning Trust Through Action” as he is actively engaged within our community and serves our citizens. Battalion Chief Evan Adolf receiving badge from Fire Chief Gary Meek. Photo courtesy of Fire District 7.